on Thursday, 25th August 2016. This year attendance is 6.5% higher and there were no proxy votes as there were no resolutions. East - 290; East Midlands - 198; London - 91; North East - 67; North West - 195; Northern Ireland - 42; Scotland - 66; South East - 411; South West - 251; Wales - 87; West Midlands - 151; Yorkshire & The Humber - 104 and Virtual U3A 1 vote. 1. 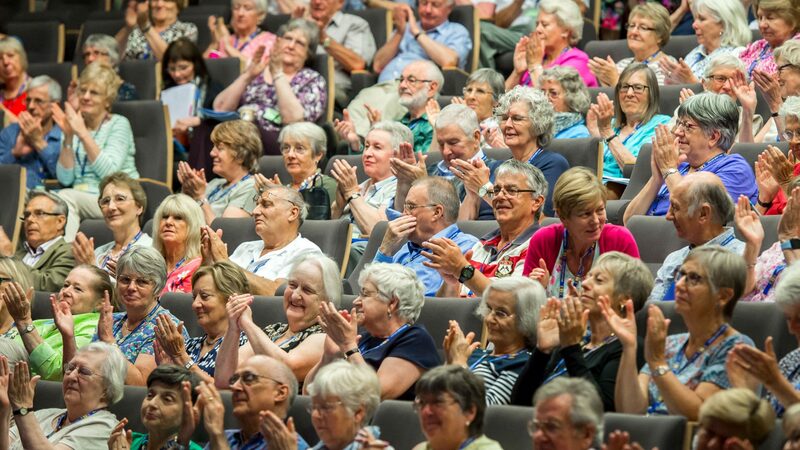 To receive and approve the minutes of the 2015 Annual General Meeting Approval of the minutes was proposed by David Martin (Ilkeston U3A) and seconded by Ann Chilton (Witney U3A) Agreed nem con with no abstentions. The appointment of Judy Briggs and Marie Bell (Arnold U3A) was proposed by Angela Howe (Medway U3A) and seconded by Bob Duckmanton (Warsash U3A). Agreed nem con. with no abstentions. The Chairman Pam Jones began her report with a tribute to the support given to her from the membership. She had been to every region and country during the past 12 months and shared celebrations, spoken at conferences and has been overjoyed at what membership achieve and the enthusiasm with which they accomplish it. The Chairman thanked the other officers on the NEC Marion Clements and Michaela Moody, the two Vice-chairmen and John Ellison, our Treasurer.Â She thanked also the Trustees, Adrian Breacker, Rose Marie Bradley, Jenny Carley, Graham Clark, Gwen Dawe, Diana Holdsworth, Hilary Jones, Ian McCannah, Jane Pavier, Tony Randall, Hilvary Robinson and Neil Stevens, who have all offered great support. The Chairman advised that the NEC has had full agenda this year and everyone had worked very hard and responded to multiple challenges. The NEC tries their best to serve the membership. She had noted the suggestions for change to the structure as well the as many who have advised they are happy with the status quo, and all views would be considered as part of the future consultation on the structure. The Chairman reflected on the achievements of the previous year, the Awareness Campaign instigated by the former Chairman Barbara Lewis, the work with universities and research instigated by trustee Gwen Dawe as well as the detailed work undertaken by the seven subcommittees of the Trust. The Finance Committee has focused on good stewardship of the Trustâ€™s resources; the Governance Committee has reviewed the standing orders, and the memorandum and articles of association; the Standing Committee for Education has focused on online resources, links with universities and has recruited a new editor for Sources, the educational periodical; the Development Committee centred on the pilot training and development team outputs and recognition of the contribution of this team was made; the Communications Committee developed resources for external use; the Research Committee has developed volunteer Â the Research Ambassador role to connect U3As with local universities, the IT Committee has promoted the development of databases within U3As and in particular the Beacon database; the International Committee has focused on a strategy for making the most of membership with AIUTA, the International organisation and Maria Chester of East Berwickshire U3A has been elected as General Secretary to AIUTA; and finally a Deaf Awareness programme was developed and promoted in the movement. In terms of other valuable work, Third Age Matters continues to be kept under review in terms of the funding model, and she thanked the Editor and the Editorial Board for their work.Â A focus on disability and accessibility has been spearheaded, by a dedicated team and it is intended that further work will be developed over the next two years. Summer Schools and events continue to be well supported and Shared Learning Projects continue to be very successful. The Chairman reflected on the contribution made to the movement by the National Office operational team and resource centre team and in particular paid tribute to Lin Jonas retiring after 20 years of dedicated service. She welcomed the new Chief Executive to the U3A. The Chairman reflected on the importance of communication, and getting the word out about the movement to more people who may want to start new U3A and then moved on to remind the AGM of the great Celebration of 1000 U3As with Baroness Dâ€™Souza and Eric Midwinter in November. Finally the Chairman thanked all for attending and exhorted everyone to keep attending, keep networking and keep spreading the word. The Treasurer, John Ellison, began his report by reminding the audience of the growth of the movement from 2000 to 2016 both across the movement and in each region. Each region is still showing growth in numbers of members but he reminded us that the movement was nowhere near saturation point in terms of potential members. The South East and East of England regions had the greatest penetration of people over the age of 65, with 5.1 U3A members per 100 people over the age of 65 in both areas. Growth continues at a net rate of 22,000 extra members a year. Reflecting on the statutory accounts, the income for the year was Â£2.37 million. The Treasurer highlighted the two main areas of income, Capitation fees at Â£1.27 million and Third Age Matters at Â£820,000. The balance of income was composed of a number of smaller items. The expenditure was Â£2.35 million with the main items of expenditure being Third Age Matters, including the Sources periodical (production, editorial and mailing), the national office team and direct support for U3As, networks and regions. Turning to the reserves, the Treasurer advised the Trust has for many years agreed that reserves should aim at being 6 months of annual expenditure and this was recently reconsidered and the policy was confirmed.Â Reserves in 15/16 have increased by Â£21k (compared to an increase of Â£197k in 14/15) and at the end of March 2016 we had 5.9 months which compares with 6.0 months at end of March 2015. This is our first decrease since the capitation fee was raised to Â£3.50.Â It is impossible to give a reliable prediction for 15/16 at this early stage although a reduction in reserves is expected. The income and spend on Third Age Matters will be kept under review during 2016/17. In terms of capitation fees the Trust can work with the current capitation Fee for 2016/17 and 2017/18 as it can stand any realistic loss out of reserves. The following questions were raised. How is Third Age Matters funded and are the margins correct? The Treasurer responded the cost and income of Third Age Matters is under review but if needed any risk can be mitigated by giving notice on existing contracts. Why is the Third Age Trust budget set at the worst case scenario? Would a more realistic budget be more effective? The Treasurer replied that the spend against budget is reviewed regularly during the year. It is better to be cautious then require multiple revisions. The budget is set in anticipation of projects and plans for the future, and it is not always possible to predict performance spend against budget. Why has the Treasurer planned for a budget deficit of Â£130K and then advised that it will not be that bad? The Treasurer responded that the Trust is looking for developments in the regions and would be happy for the expenditure to be made, however on past performance the maximum budget spend is often not reached. A question was raised about whether there were grants for networks? The Treasurer explained that five or more U3As may apply for a grant to undertake activity together. The maximum grant was Â£500. The proposal to accept the accounts with the correction to the incorrectly repeated figure was made to the AGM. Majority voted in favour, with three abstentions. Majority voted in favour with one abstention. The East of England Region had elected Jeff Carter. Scotland had two candidates standing for election; Tom Berney received 18 votes and Ed Link received 20 votes. Ed Link was duly appointed for Scotland. 8. The AGM gave its thanks and farewell to the hard work and dedication of Lin Jonas to the movement. The AGM was formally closed at 12.40pm.